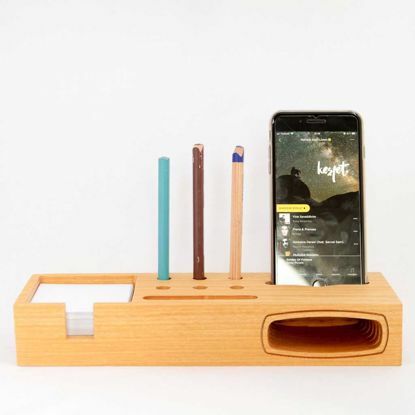 This Acoustic Phone Stand is made of Ayous. There is no dye and stain involved. You see the natural colors of wood. Wood has been finished with natural wax. 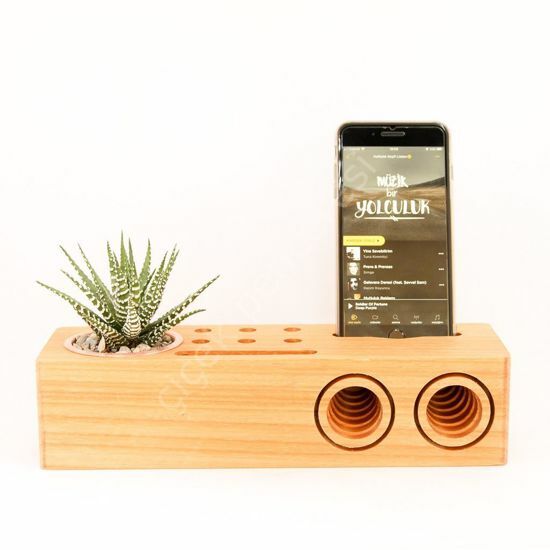 It is designed to amplify your cell phone’s sound while providing a beautiful stand to hold it. You can charge your phone on the stand as there is a cable channel. It contains a handmade copper flowerpot inside. It has six pen/pencil holder and a place for business cards. Amplifier function works with any phone with speakers located on the bottom. The cradle size is 3.5” L x 0.4” W.
Due to the handcrafted nature of this item, materials, dimensions, and color may vary slightly. The phone and plant in the picture are for visualization. They do not come with the product. Acoustic Phone Stand, designed to amplify your cell phone’s sound while providing a beautiful stand to hold it.